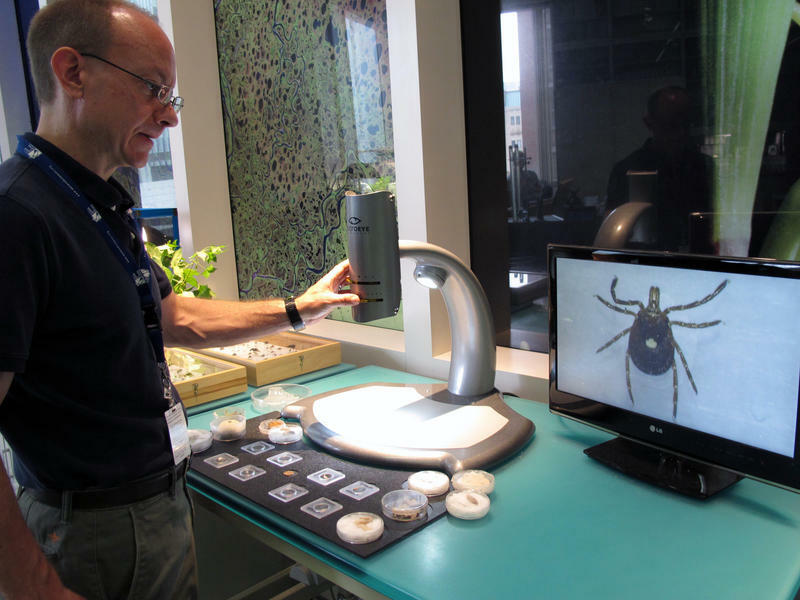 In this July 31, 2014 photo, Dr. Colin Brammer, an entomologist at the North Carolina Museum of Natural Sciences, displays a lone star tick in a lab in Raleigh, N.C.
Dog and deer ticks are well-established in Maine and cause an a number of illnesses. Now, another species — the lone star tick, typically found in the southern U.S. — appears to be making inroads here, and it brings with it a surprising reaction. Just about every day, Patty O’Brien Carrier works the gardens that surround her cottage in Harpswell to nurture flowers that have grown here for decades. But lately, something else has taken hold in her gardens. She says she finds ticks on her pretty much every day. Carrier used to see ticks as a minor nuisance. But now they’re a more serious threat, and she wears a gardener’s version of armor for protection: boots, long socks, long pants and long-sleeved shirt — all of them coated in insect repellent. “Suiting up, and getting ready for the war zone,” she says, with a laugh. It started a year and a half ago. Carrier was in Maryland visiting her daughter when she woke up in the middle of the night. Patty O’Brien Carrier in her gardens in Harpswell. Carrier’s airway was closing. She was having an anaphylactic reaction. Her husband called 911. After she was stabilized in the hospital, Carrier says doctors quizzed her about what she had eaten and possible allergies. “The only thing I ever had an allergy to was a bee sting, and nothing else. So we left the hospital at 6 a.m. very confused as to what could possibly have caused this allergic reaction,” she says. Months went by. Then, last January in Harpswell, Carrier again woke up in the middle of the night, itching and red, her airway closing. Again, she called 911 and went to the hospital. After she recovered, she decided to get an allergy test. Within a week, she got a phone call with the results. “I was cooking a pot roast that I had been cooking all day long and the house smelled absolutely yummy. And she called and she said, ‘I’m sorry to tell you this, but you can no longer again eat mammal.’ And I said, ‘In one phone call I’ve become a vegetarian?’" she says. Mostly. Carrier can’t eat any meat from hoofed animals. “So this is sort of a unique kind of allergy,” says Dr. Marguerite Pennoyer, an allergist and immunologist in Scarborough. Pennoyer’s not Carrier’s doctor, but she has diagnosed other patients with this red meat allergy. The source, she says, is the bite of a lone star tick. “The cement the tick attaches to its victims has a special sugar in it that is called alpha-gal. And this sugarlike molecule is found in all mammalian meats except humans and monkey meat,” she says. When that alpha-gal sugar molecule enters the human body, it’s treated as a foreign invader and triggers an allergic reaction. Unlike other allergic reactions, this one is usually delayed by several hours. That’s why Carrier woke up in the middle of the night, after she had dinner. “I didn’t put the pieces together until the diagnosis. And in both instances, I had had beef,” she says. Beef was a rare treat for Carrier. She usually ate pork, which the tick bite didn’t cause as strong an allergic reaction to. She’s not sure when or where she was bitten by a lone star tick. It might have been in her garden or while traveling. Historically, the lone star tick — named for the single white spot on the center of its back — has been found in the southern U.S. But Chuck Lubelczyk, a vector ecologist at the Maine Medical Center Research Institute, says populations have been found in coastal Connecticut and Massachusetts — and there are rare instances of people getting bitten in Maine. “Usually this is because these ticks, like deer ticks, get transported by migratory birds in the spring and get dropped off up here,” he says. 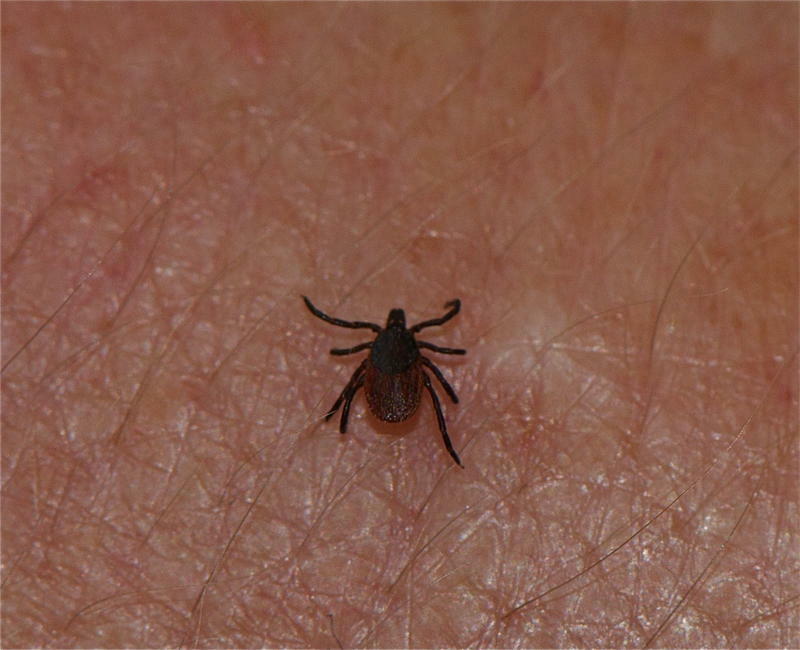 Lubelczyk says researchers are keeping active watch to prevent any populations from getting a foothold in the state, because these ticks also behave differently than others. “Where they get established, there are just volumes of these ticks on the ground,” he says. And, unlike other ticks that passively wait on vegetation to latch onto whatever brushes against it, the lone star tick is more aggressive. “It’s a little bit scarier I guess in thinking about the fact that it will kind of pursue you,” says Griffin Dill, who coordinates the tick ID program at the University of Maine Cooperative Extension. This tick detects and actively pursues its host. It may sound like the makings of a horror movie, but Dill advises to keep things in perspective. The lone star tick will only travel so far, so fast. “I think I could outrun it,” he says. There’s a silver lining for the meat allergy too: some people outgrow it. Carrier hopes she’ll one day be able to enjoy a steak on the grill again. But for now, she’ll stick with salmon. Ticks & Lyme: What's The Outlook For Vector-Borne Disease? Listen to Maine Calling's discussion on ticks. What is the forecast for ticks and Lyme disease this year? Has the extended cold pushed their arrival later—or are they out there already? Are there other vector-borne diseases that are of particular concern?